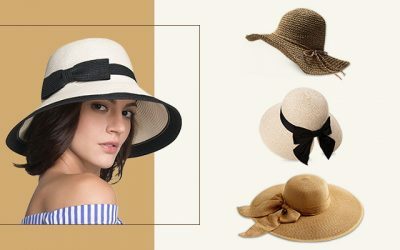 Floppy hat is typical the most common type of women hat for the summer, not only for its elegant look but also for its functionality. 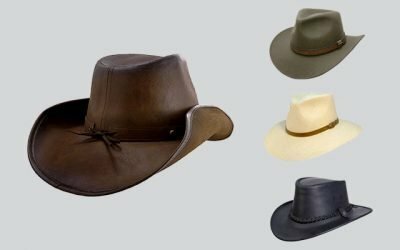 With a wide brim, the hat could be able to cover a wide area of your face, helping you to stay away from the harsh sun rays. 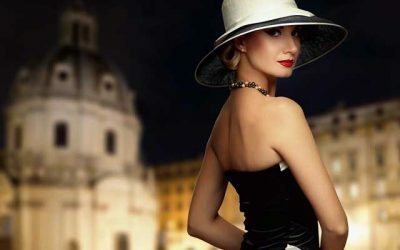 You can also check out this article for more types of women summer hats to choose from. It is very important to look for high quality Women’s Floppy Hats. A good hat needs to be made of premium material which is rated at least 30 + for the ultraviolet protection factor. Other factors you need to consider including the breathability or the weight of the hat. 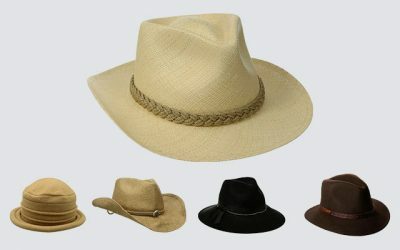 This article will provide you more information on choosing a suitable summer hat. Nevertheless, a floppy hat is a must, must-have item in your wardrobe for the coming summer of 2018. With thousands of choices that you can have on the market, check out our top picks below to see what the best options for you are. This hat has everything that you would need in a high quality floppy sun hat for the summer. It is made of knitted lace ribbon with fabric material which is 100 % of cotton. The cotton material is soft and smooth while providing a lot of breathability for the hat as well. The sweatband of this floppy sun hat is made of high quality cotton material as well. Therefore, this hat is capable of wicking moisture away and keeping your head cool all of the time. It can also provide extra comfort for you when you have to wear this floppy hat for a long time during a hot summer day. Another great feature of this hat is that it can be folded and packed into a small bag for you to bring along with you when you go travelling. Also, it can be easily ironed for the brim to become flat. The brim of this hat is about 4.3 inches, which is wide enough to keep both of your head and neck from harsh sun ray. It features a detachable bowknot around the hat crown to add more elegancy to the hat itself. There are 8 options of colors for you to choose from including khaki, pink, black, and white. There are 2 sizes for you to choose from. And with the adjustable hat string, you can easily fit the hat around your head. 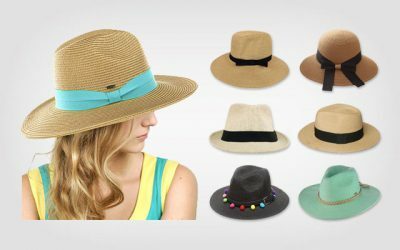 If you are looking for a floppy beach hat to wear when you go to the beach, there is no more suitable hat than a hat which is made of straw like this summer hat from lethmik. 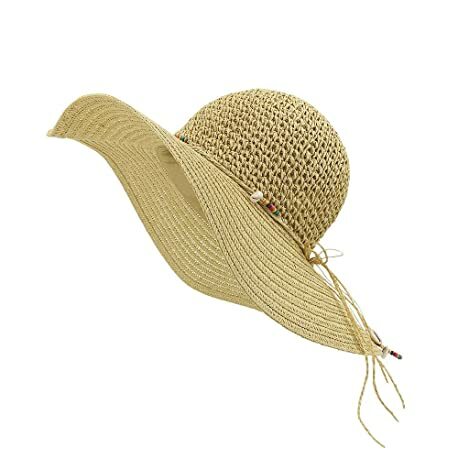 This floppy sun hat is made of 100 % of high quality woven paper straw. It is available in 2 options of colors which are beige and khaki. This material is the best material for a beach hat because it is breathable and comfortable to wear in a hot summer day. It is lightweight and very durable as well. Also, it tends to have a quick drying performance. The weave is tight enough to protect you from the harsh sun rays but is also loose enough to provide extra coolness for your head. While this hat is available in 1 size, there is an adjustable strap inside the sweatband to have you get a custom fit on your head. You can wear this hat not only when you go to the beach. With its simple yet stylish design, you can wear this floppy hat when you hang out with your friends. You can also wear this hat when you go camping or go gardening. The brim is quite firm and solid, which cannot become flimsy at all time. 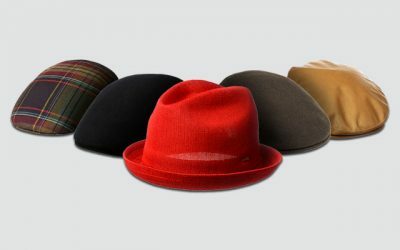 In addition, you can shape the brim to whatever shape you desire to match with your style and your hair. It is also crushable so that it is convenient for you to pack the hat and carry it around with you. Keep in mind that with this woven paper straw floppy hat, you couldn’t wash it in the washing machine or use a brush to clean this hat to prevent causing damage to the quality of the fabric. Are you looking for a super wide brim floppy hat? Then this hat is the best option for you. The brim of this hat is 7 inches, which is slightly wider than other floppy hats on this list. 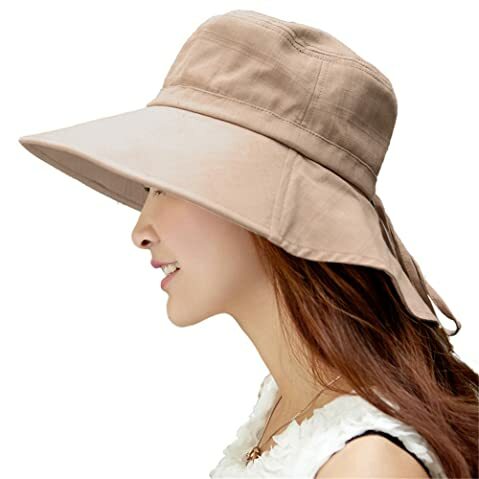 With such a wide brim, you entire face, neck and ears are protected from the harsh sun rays. This beach wide brim floppy hat is made of 100 % of cotton. And like other high quality cotton hats on the market, this hat is breathable and comfortable to wear even in the summer. More significantly, this floppy hat is rated 50 + for the ultraviolet protection factor to provide the greatest protection for your skin from the harmful UVAs and UVBs. The hat is also made with a mesh part inside to provide extra ventilation to keep your head cool and comfortable all of the time. There are 5 options of designs for you to consider. Moreover, you can easily turn the hat around for an entirely different design. In another word, you have a hat that can be worn in 2 different looks, making it fun for you to change the style that you want. The problem with the super wide brim floppy hat is that in case of a high wind; the brim can become super flimsy, which can block your view. Also, there is no chin cord to keep the hat on your head in such case. Some of the floppy hats on the market don’t come with wind landyard. Still, this feature is quite important if you want to buy a floppy beach hat. When you go to the beach, it is often quite windy and there is no safer way to keep the hat stay secured on your head rather than wearing a hat with a landyard. This floppy hat for women from Slogger can be the hat that you need as it features an adjustable wind landyard to keep the hat stay secured on your head no matter what. This hat is made of 100 % of braided material with a high quality hat band from cotton for the best comfort for your forehead. The built-in sweatband of this floppy hat is of high quality that is capable of absorbing sweat effectively and providing extra comfort for you as well. Another thing that I love about this hat is that the brim of this floppy hat is not only wide but it is also very firm and solid. As a result, it doesn’t become flimsy in case of windy weathers. To sum up, with an adjustable windyard and a firm brim, this is one of the best floppy hats for women to wear when it is windy outside. While the brim is tough and you can shape it to the curve that you like, this floppy hat is not foldable. You can choose among 10 options of colors such as brown, blue, and coffee cream. These colors are solid and fade resistant as they will not change their shades regardless of how intensively you wear these hats. In case you are looking for a stylish and colorful hat, check out this big floppy hat from Bievenu. This hat is made of 100 % of high quality cotton. The brim of this hat is among the widest options that you can have on the market with the width of 7.5 inches. The crown of this hat is 4 inches in height. The brim of this hat is wide enough to provide a great coverage for your face, your neck as well as your ears. In addition, in case you go out in a day that is not really sunny, you can remove a part of the brim using the buttons circling around the brim. The material of the brim is rated 50 + for its protection against the ultraviolet elements including the UVAs and UVBs to add extra layer of protection for your sensitive skin. In addition, it is breathable and lightweight. Not to mention that you can roll it and pack it inside your bag for conveniently carrying it around with you when you go travelling. 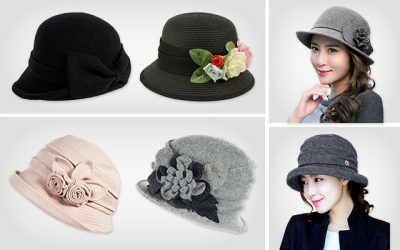 You can choose among 6 patterns and solid colors including black, pink, and white floppy hat. This floppy hat is reversible so that you can have 2 different hats in just 1. 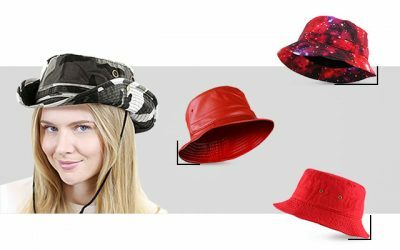 So you can wear 1 floppy hat in 4 different ways- you can wear it as a large and wide floppy hat or you can wear it as a bucket hat with a small brim. And you can also have 2 different styles to change. 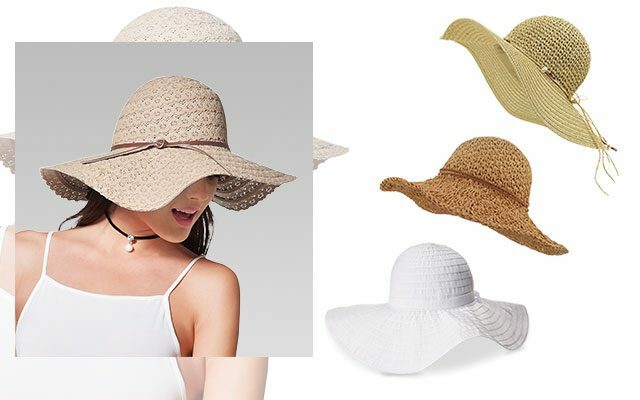 So if you are looking for a versatile hat to wear in many different ways to go to the beach or for casual daily wear, this floppy hat is for you. This hat is available in a wide range of colors including stripes and solid colors. If you are looking for a black floppy hat, check out this high quality and stylish floppy brim hat. A black floppy hat like this one is a must have in your wardrobe as you can match it easily with a lot of clothes that you have- from dresses, to shorts and jeans. This trendy and stylish brim hat is made of 100 % of paper straw. The material is thick so that it can block the harmful sun rays from damaging your skin. Yet it is also lightweight and comfortable to wear, even when it is hot outside. And don’t worry that the paper straw will cause irritation on your forehead as the inner cotton sweatband will protect your head from rubbing. In addition, it is capable of wicking moisture away to keep your head cool all of the time. 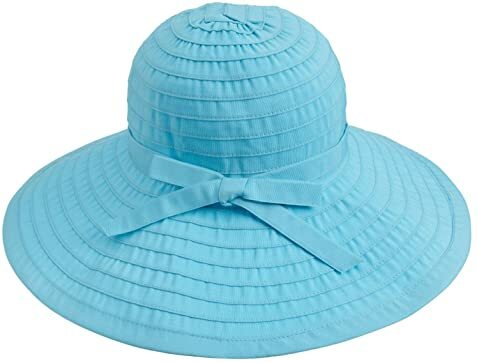 The brim of this floppy hat is 4.7 inches in width to protect your face as well as your neck and your ears effectively from the directly sunshine. The chin strap that comes along with this floppy hat will keep it from flying in case of the windy weather. However, the brim can become floppy and block your vision in such the case. This hat is foldable and packable. Still, the construction of this hat is very firm and solid that no cease will appear on your hat even when you have been wearing this hat for a long time. Here comes another high quality floppy hat with a moderate wide brim. This hat is made of 20 % of cotton and 80 % of polyester. The width of the brim is 4.7 inches and the height of the crown is 5.5 inches. The brim of this floppy hat is wide enough to protect a part of your face and your neck without covering your eyes in case of a high wind. The thing that I love the most about this floppy hat is that it is made with an excellent craftsmanship which you can see in the solid construction and the evenly stitched threads. An adjustable chin cord is attached to the hat to ensure it can stay fit and secure on your head no matter what. 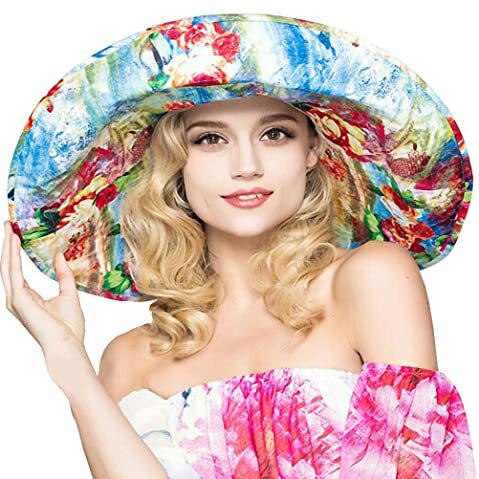 Like other high quality floppy hats for women to wear in the harsh summer, the fabric of this floppy hat is rated 50 for its ultraviolet protection factor. Furthermore, you will find it comfortable to wear the hat in the hot summer days as the material of this hat is very lightweight and well ventilated. You can also easily fold this hat and when it can get it back to its original shape, there is no cease on the hat. Last but not least, there are many colors for you to choose from including the natural colors such as beige and khaki as well as the bright and dark colors. With its simple design and solid look, as well as the additional features such as the chin cord, you can wear this hat in various activities including hiking, camping or biking. In case you are looking for a girly and elegant floppy hat, why don’t you check out this cute hat with ribbon from Simplicity? 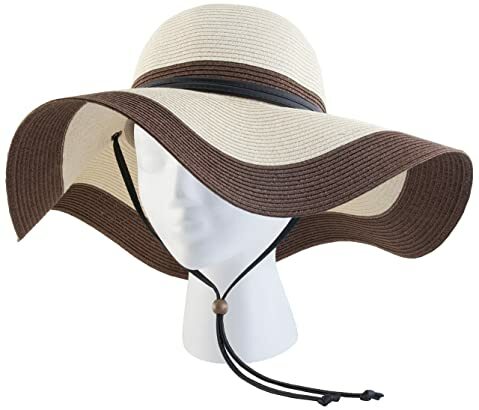 This floppy hat is available in many unique and bright colors such as aqua, pink and rose as well as dark colors such as black and chocolate. This hat is made off 100 % of polyester which is rated 50 + for its protection against the UV rays. The material is lightweight, well ventilated and also very durable. With its vibrant color and the beautifully sewn ribbon, you can wear it for vacation travelling, gardening, and casually hanging out with friends. This hat comes with a shapeable brim thanks to the iron wire frame on the inner edge of the brim. With such the feature, you can easily reshape the brim to the design that you want. 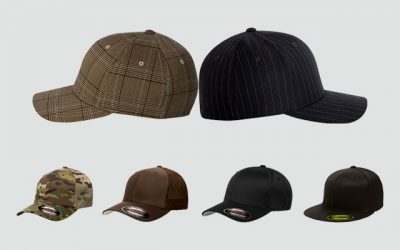 Also, the brim can stay in shape and will not become flimsy in case of the windy weather. Overall, the construction of this hat is so well made that you don’t have to care much for it yet it would stay in its shape regardless of time. Since this hat is made of 100 % of polyester, this hat has a quick drying performance. You can easily wash this hat in the washing machine or by hand. Regardless of how many times you wash this hat, it still looks bright thanks to the fade resistant fabric. Also, the hat is well made for a solid construction that will last for a long time. The next trend of beach floppy hat is the one with a certain quote embroidered on the hat. A certain clear example of this style is this floppy hat from Funky Junque. 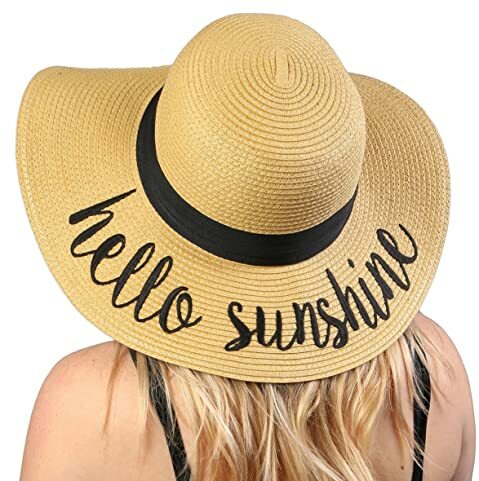 You can choose among several quotes such as “Hello Sunshine”, “Bon Voyage”, or “Ciao Bella” for this hat in the neutral color such as khaki and beige. You can consider it as a way to express your currently feeling or a unique way to set this floppy hat aside from other floppy hats that you can find on the market. You can wear this hat for your beach holiday. You can also wear it when you hang out with your friends or have a casual date. This floppy hat is made of straw featuring a medium-wide brim and a cinched black ribbon. The quote is embroidered circling on the brim of the hat to add an extra elegant accent. It also comes with an adjustable string for you to adjust to the suitable sizing. While this hat is beautiful, it is also very functional. With a wide brim, your face as well as your eyes, neck and ears are protected from the direct sun rays. It is made of 100 % of paper straw, which is soft and lightweight. It is also thick enough to block the harsh sunlight away from your face. The main problem with this floppy hat is that like other supper floppy hats on the market, the brim can become flimsy and cover your eyes in case of a big wind. Also, there is no chin cord to help keep this floppy hat stay secured on your head. 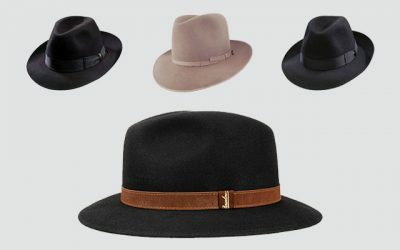 Last but not least, take a look at a beautiful, charming and versatile wide brim hat from LETHMIK. 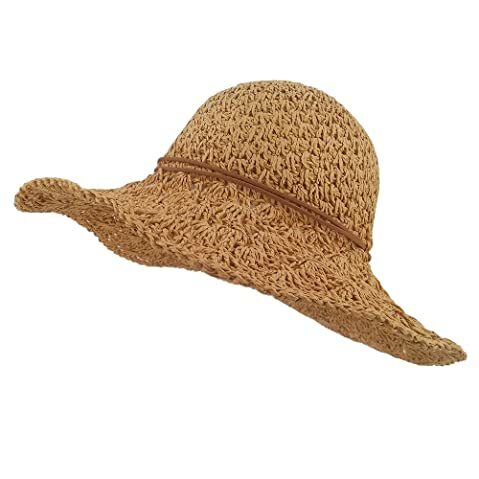 This hat is made of 100 % of high quality natural paper straw. 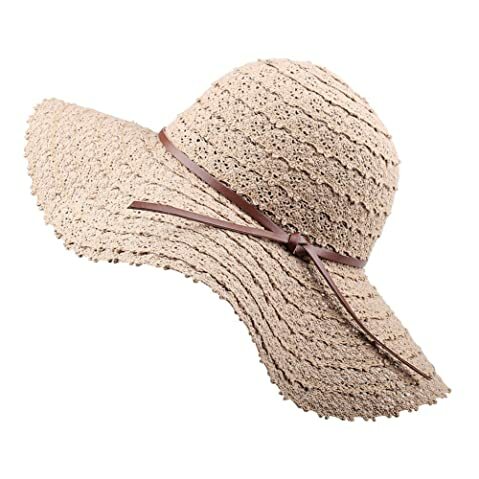 And since this hat is made of the natural straw, it is available in 2 options of colors, which are beige and khaki. The straw is woven nicely, tightly, and sturdily to make sure this floppy hat can last for a long time. While the straw is woven thick enough to effectively block the harmful sun rays, it is also very lightweight and comfortable. And while there is no internal head band, the straw material is soft and well ventilated enough to ensure your head is cool and you feel comfortable all of the time. And I have to mention that the fabric of this hat is rated 50 + for its ultraviolet protection factor that can help block the harsh UVAs and UVBs. The brim of this hat is 4.3 inches, which is wide enough to cover your face and your ears and protect your sensitive skin from the harsh sun rays. In addition, while the brim is quite flimsy, it wouldn’t block your vision in case of a big wind. Due to the natural material, you should pay attentive care to ensure that this floppy hat can last for as long as possible. For instance, you should wash it by hand only and prevent washing it with hot water or iron it. That is all about the newest best women’s floppy hats in 2018 for your consideration. As you can see from the list above, while the common feature of these floppy hats is the wide brim, they are different in so many factors. You can choose among different materials including cotton, polyester, straw, and even felt. They are also different in colors and designs as well. There are certain features that you also need to consider whether you need them or not such as the chin cord, the shapeable brim, or the inner headband. Overall, in the summer, it is super important for any woman to wear a summer hat which is capable of protecting her face while still making her look trendy and fashionable. 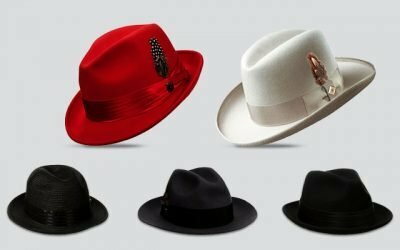 I hope that with all of the recommendations above, you can quickly decide which floppy hat is the most suitable for you and buy it.